Sheltered in the eastern flank of the Penwith Peninsula, facing Mount's Bay, Penzance (pop. 20,000) is the last town at the southwesternmost corner of England before Land's End. 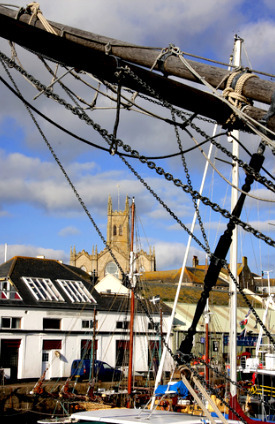 The name Penzance is derived from the Cornish pen sans, meaning "holy headland". The town has been a busy port for centuries. It was granted various Royal Charters from 1512 onwards and incorporated in 1615. The Spanish fleet bombarded in the medieval city in the 16th century, and most buildings nowadays date from the Georgian and Regency era. It is now one of Britain's busiest fishing port. Like nearby St Ives, Penzance has attracted artists since the late 19th century. Some of the finest example of the Newlyn School, including such painters as Stanhope Forbes, Walter Langley and Lamorna Birch, are displayed at Penlee House. Set in the middle of town, the Morrab Gardens is a public space with numerous sub-tropical plants, such as tender trees and shrubs, many of which could not be grown outdoors anywhere else in England. The most eye-catching building in town is the ostentatious Egyptian House in Chapel Street. It was built in 1835 to house a geological museum, but later abandoned until its recent restoration. The statue of local chemist Humphry Davy (1778-1829), who invented the miner's safety-lamp, stands in front of the Victorian Market House. Also of interest is the sea front with its promenade and Jubilee Bathing Pool, as well as the Trinity House National Lighthouse Centre (open Apr-Oct 10:30am-4:30pm; admission £3), which has an instructive exhibition on maritime safety. A stay in Penzance would not be complete without a visit to the dramatically set St Michael's Mount, a few kilometres east of town. 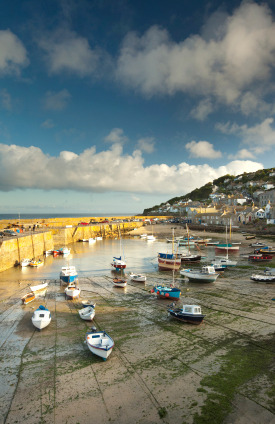 The fishing villages of Newlyn and Mousehole, in the opposite direction, are also worth a stop for their quaint charm. Provided you have your own wheels, a trip to Land's End should also be on top of your list. 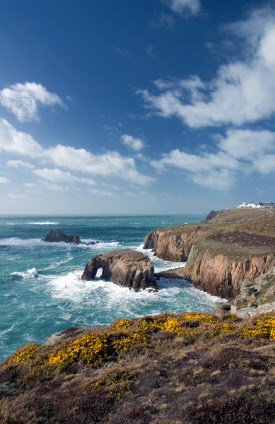 Besides being able to say that you have been to the extreme south-westerly point of the British mainland, Land's End is usually the scene of spectacular raging waves of the Atlantic Ocean crashing on the craggy promontory. 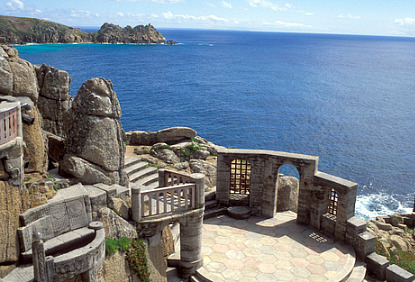 4 miles (6.5 km) south-east of Land's End, at the other tip of the peninsula, you will find the Minack Theatre, an open-air theatre built on a rocky granite outcrop near Porthcurno. It was designed in 1932 as a stage for Shakespeare's The Tempest. Plays are still performed every summer. The full season from June to September features 17 plays. Dolmen enthusiasts will head for Lanyon Quoit, 4 miles north-east of Penzance. It is located along the small country linking the villages of Madron and Morvah. 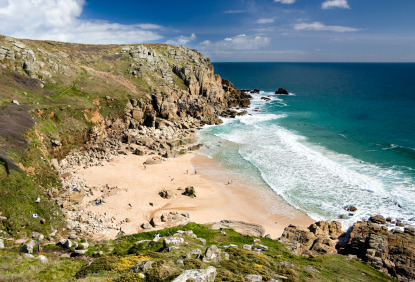 St Ives is located 450km southwest of London, and is the last train station before Land's End. The fastest way to get there is to fly to Newquay first, then catch a train. There are trains from London Paddington (5h, £53 super advance single), Exeter (3h to 3h30, £20.70) and Plymouth (2h, £11). National Express has coaches from London (9h, £41), Plymouth (3h30min, £7.25), Newquay (1h15min, £5.50), Truro (1h30min, £4.75) and St Ives (25min, £3.25). There are frequent bus service to Land's End (1h).